Should I Do User Testing For My Website? What do comedians and smart website owners have in common? Answer: They both TEST their material on as many people as possible! Most people like to think they have a sense of humor. Similarly most people think they have good design sense. But at the end of the day those are really nothing more than opinions. The only way to know for certain is other people’s reactions. Of course if you ask your mom or your best friend to rate your website they will probably be much too polite to point out some of the things going wrong. 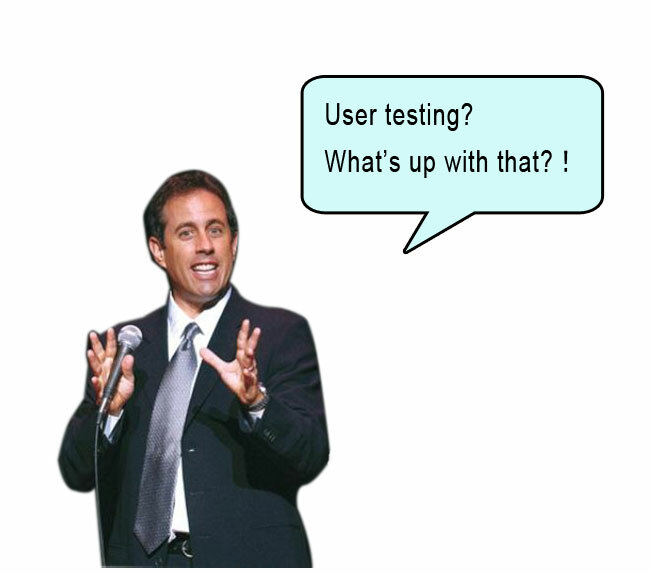 What you really want is a bunch of unrelated people to form a user test group. The more the better. But even one test user is 100% better than none. Artistic people like websites with lots of visual interest so they tend to think that other people want to see websites with lots of color and design originality too. Other people like feature rich websites and believe that is what other users are looking for. Then there is often a third group who push for elements that support a marketing revenue agenda. Usually there is no “right” way to build a website. If there were, a lot of websites would all look the same. What matters is creating a site that integrates its many elements to meet a particular carefully thought out goal. And the only way of really being sure how well it does that is to conduct some usability testing. You need to sit a test subject in front of the screen and ask them to execute some specific task. By observing the user and asking them to think aloud you can find out many interesting things about your site. These are often things that didn’t occur to us as website owners because we “can’t see the trees for woods”. We know our business so well that we assume other people start with the same set of base knowledge and perception. So its important to test with “fresh” eyes each time. Ideally, you would want your test group to be representative of your target audience, particularly if there are cross cultural issues at stake. There are plenty of celebrated examples of companies making infamous marketing blunders because they didn’t take the time to find out enough about their target market’s culture or language. The Chevrolet Nova for example was a great selling car in the USA. But did poorly in Mexico. Why? Well the fact that “no va” in Spanish means “doesn’t go” probably didn’t help! There are of course some design approaches that are always wrong and others that are usually wrong. In some cases though, usability testing won’t necessarily prove or disprove any particular design argument. But what it might just show is that the things you were worrying about were actually the wrong things. A bit like arguing over the color of your new sofa when all along you really should be discussing the shape, style or size. Usability testing can provide empirical evidence to back up experience, common sense and professional judgement. Website owners should start testing early and test often in the design process.